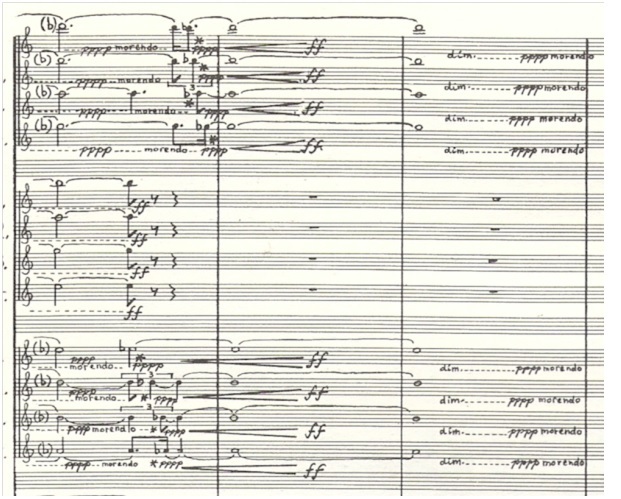 Before even looking in any depth at the notational content of Ligeti’s Atmosphères, it becomes clear to the reader when looking over the piece’s prefatory notes, that this is not a typical example of orchestral music. 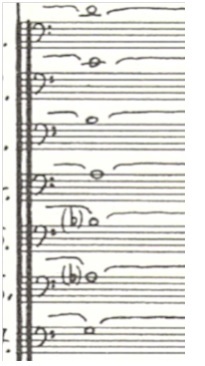 In fact, these opening notes make very clear that Atmosphères is almost deliberately against the grain of more typical orchestral works, even explicitly so in Ligeti’s descriptive language and instructions to the musicians. Everything about this piece of music has an angst-ridden rebellion ingrained into its every motive, not merely just its tonality and musicality but even down to its structure, its treatment of rhythm and the various ways classical instruments are used (i.e. not playing instruments in the usual manner.). “The bar lines in this piece are purely a means of synchronization of the individual parts and an aid to temporal articulation.” (p.1, score). “All in all, you cannot hear my music as it appears on paper. Of course, while actually composing each piece I worked on what we hear, as we hear it. The technical process of composition is like letting a crystal form in a supersaturated solution. The crystal is potentially there in the solution but becomes visible only at the moment of crystallization.” (1983, p.15). This gives Atmosphères a natural freedom to almost haunt auditoriums as it is played, coming and going like natural occurrences such as a rain shower. This freedom also allows Ligeti to delve deeper into his own tonal labyrinth, exploring various, tonally excessive but dynamically subtle canons in a vast tapestry of micopolyphony. “They are content not only with fewer Formanten but also with the beat’s being subdivided into fewer units, that is, one to six. By varying the additive values, they achieve, in the context of an “additive” polyphonic texture, the effect of “hovering” or indeterminate rhythm.” (p.143, 2002). The same “hovering” effect being described here can equally be applied to Atmosphères. Hovering in particular is an apt tie-in to Ligeti’s prefatory notes in that it is merely the means towards synchronization and not laden by the lead-heavy weights of bar lines and meter. The idea of meter being a weight on music is one that is not new but also one that Ligeti, more than most composers before him, risked discarding. A section from Atmosphères is presented below. Because of the detail of this piece, trying to focus in on specific elements can be tricky, if only due to the complexity and scale of the score. However, this particular section (the C section from bar 23 to 26) shows a number of Atmosphères‘ defining traits. Before this section, the first great moment of Atmosphères has taken place. The slow build of shimmering strings and woodwind has built from a humming of tones, so quiet that it could almost be silence. In bars 18-22, all of the piece’s main instruments, from woodwind to strings and even Atmosphères‘ rare use of brass in the form of trumpets make their presence finally known in a double crescendo. The section above is the fallout from that double crescendo; one of the few moments in the piece that dares to rise above an ambiguous existence and mark itself dynamically with Fortissimo. This section allows the full potential Ligeti’s micropolyphony to come to the fore, almost signifying a great cataclysm such as the Big Bang; an apt tie to its use at the start of Kubrick’s film. Here we can follow this metaphor through musically, with the Flutes, Clarinets and Violins (I and II) representing the different matter from that fallout whereas the Violoncello and Contrabasses continue as a imprint of the cataclysm itself. Built from the bottom, the notes are G, Ab, Bb, A, B, C, D. The potential for chords is great, ranging from a G minor triad to hints of A minor (only missing its 5th) and Bb dominant (again missing its 5th but with the minor 7th hinting at its position of V). This gives potential scope to multiple layers of polyphony, though Ligeti holds back for a number of bars, allowing various instruments to build up the layers of canons, albeit extremely quietly. The description of patchwork applies in once sense. Though such a description may have negative connotations (implying that the piece is a random amalgamation of bits and bobs), it seems apt for this section which is created from a complex web of canons that appear to be one whole when perceived at a distance (like the stitching on a patchwork quilt). These canons begin in the first violins during bar 24 and build, creating faster and denser layers of notes. Ligeti believes that “…you cannot actually hear the polyphony, the canon. You hear a kind of impenetrable texture, something like a very densely woven cobweb.” (1983, 14). Though this suggests that musical analysis of these sections is less productive in the context of its final effect, it is still as useful tool. Another aspect, that so far has been assumed, is that the tonality of the layers that Ligeti has presented is normal and, in the context of Ligeti, they are. However, moving away from tonality to such a degree cannot go unnoticed and it is again in this section where we find this prevalent. In the canons of the first violins, there are a range different motifs being built. Towards the end of bar 24, the main crux of the polyphonic layering comes into play and is built upon further from that point. 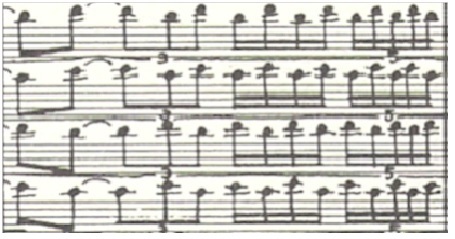 In the first violins, a range minor third motifs are quietly staged (B to D, A to C, D to B and A to C). This allows a sense of fluidity with the previously mentioned low range shimmering of the Violoncello and the Contrabass, simultaneously creating chords and masochistically destroying them in order to create an ambiguous and unsettling layer of sound. “1. By abandoning the sensation of time in music as actively “pulsating,” as connected first of all with the vivid “foregrounding” of meter and metrical rhythms. By moving toward ametricability (the repudiation of meter, or else its subjugation), and, in general terms, by eliminating the feeling of time through deactivating the metrical rhythm or somehow neutralizing its power to activate. 2. By denying that the dynamic forward movement of form is the sole, irreversible possibility – by creating open variable forms (which permit multiplicity of realizations) or by creating forms that in principle are static (a form of “moments”).” (2002, p.147). This “abandoning” of time has already been addressed though not quite through how this is achieved through tonality. By constantly suggesting a number of potential keys and chords (often through the serendipic creation of cluster chords within the micopolyphony) Atmosphères is indeed best described as a “moment” rather than a typical composition. Ligeti explained his static form in music stating “I first began to think about a kind of static music you find in Atmosphères and Apparitions in 1950; music wholly enclosed within itself, free of tunes, in which there are separate parts but they are not discernible, music that would change through gradual transformation almost as if it changed its colour from the inside.” (1983, p.33). Much has been written about Ligeti’s historical experiences coming into play during his work and this conception of a “moment” is the perfect lead in to a symbolic realisation of things that perhaps are too painful to discuss in a more typical, meter-centric types of composition. While this essay will later argue for this musical analysis to be applied to Kubrick’s largely positive narrative, it must also point out the irony of such a use. Atmosphères, especially in its tonality, seems deliberately uncomfortable, rising only to several points of release which, even then, are tonally abstract and marked out as high points in the musical “arch” through dynamics more than anything else. We must consider what this is potentially a reflection of, if only to point out the irony of using it in Kubrick’s narrative about creation and humanity moving forward. Referring back to Atmosphères‘ first point of release in bars 18 to 22, we can see something almost cathartic, perhaps even a realisation of an inner pain occurring. This release is abnormal to the rest of the piece and only really occurs once more during its running time. Bars 18-22 however, feel stronger and more shocking because nothing within the piece so far has really changed, at least in terms of dynamics. Ligeti’s relationship with The Holocaust of the Second World War is well documented, being forced into a labour group while both his parents were sent to Auschwitz (his mother being the only survivor of his close family). This often comes as an essential piece of information about the composer as shown from this excerpt from his obituary in The Seattle Times; “Mr. Ligeti was born in 1923 to Hungarian parents in the predominantly ethnic Hungarian part of Romania’s Transylvania region. His father and brother later were murdered by the Nazis. He took Austrian citizenship in 1967 after fleeing his then-communist homeland. He began studying music under Ferenc Farkas at the conservatory in Cluj, Romania, in 1941, and continued his studies in Budapest. But in 1943, he was arrested as a Jew and sentenced to forced labor for the rest of World War II.” (Kole, 2006). “The more total society becomes, the greater the reification of the mind and the more paradoxical its effort to escape reification on its own. Even the most extreme consciousness of doom threatens to degenerate into idle chatter. Cultural criticism finds itself faced with the final stage of the dialectic of culture and barbarism. To write poetry after Auschwitz is barbaric. And this corrodes even the knowledge of why it has become impossible to write poetry today. Absolute reification, which presupposed intellectual progress as one of its elements, is now preparing to absorb the mind entirely. Critical intelligence cannot be equal to this challenge as long as it confines itself to self-satisfied contemplation.” Adorno – (1982, p.34). “Ligeti and his co-liberalist Michael Meschke have written a kind of secular last judgement for the apocalyptic world in which death does not win, for once against all expectations. This utopia is created by the use of grotesque, parodistic, absurd and surreal effects and halfway diadastic texts. Ligeti’s music underlines this approach with its permanent ambiguity, its collage-like character, its allusions to styles and specific compositions, and its mix of tragedy and farce. The composer does not just protest against death as something natural, but rather against death as he (and Kertesz) experienced it during the Holocaust: death caused by dictators who decided completely arbitrarily who lives and who dies.” (2011, p.84). This shaping is abundantly clear in Atmosphères; a piece about the slow realisation of the horrific and atonal, only becoming apparent when it is too late and which then quietly submerges back into the ether as if in total shock at its own morbidity. Indeed, if we consider the piece’s two moments of heightened dynamics, this reading can be spread further, suggesting one being the instigation of the removal of people by the Nazis and the other representing the moment of realisation by the outside world. In Adornian terms, this attachment to tonal “ugliness” could be said to form a rebellion against a fascist past; “The condemnation of ugliness in conservative aesthetics finds support in a subject inclination that has been verified by social psychology, namely the inclination to equate -justly- ugliness with the expression of suffering in order to berate it projectively.” (1970, p.73). Even the moments in between can have this symbolic resonance within it; the slow build being the gradual rise of anti-Semitism, the gradual fall being the quiet, chaotic fallout from the realisation of one of humanity’s most brutal atrocities. The moment from the score above shows, at least in this reading, the first moment when the horror has been instigated, showcasing a strong, primal cry of all of the instruments before allowing micropolyphonic layers to show the fallout and dismay at the actions. While more analysis could be dedicated to the eccentricities in the score (the use of the piano as a percussive instrument, the overtly original instrumentation which seems to have an inordinate amount of violins and woodwind etc.) it is of little consequence when the previous point is to be considered. Ligeti and Atmosphères shows a clear rebellion against the past. This isn’t simply because of the desire to push musical boundaries forward but because, as Adorno would argue, there really is no way back after The Holocaust. In this sense, Atmosphères uses its dynamics, pitch and tonality to remove itself from past while simultaneously (maybe even subconsciously) addressing it. Perhaps it is this aspect that makes it so much more of a “moment” than simply a metered composition; further tying in the ideas that help to explain its use in a futuristic narrative about an equally powerful cycle, albeit one that is more positive in both its transitions and its outcomes. This is a simply fantastic piece, brilliant work! Thank you 🙂 Glad you’re enjoying it so far. Under The Skin (Jonathan Glazer) – The Human Landscape. The Missing Picture (2013) – Rithy Panh.